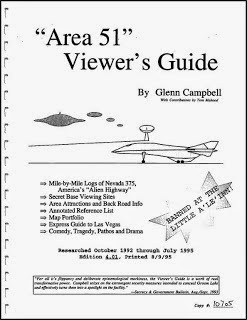 For the first time in history, my Area 51 Viewer's Guide from the 1990s is available FREE to anyone who cares to download it. This is my visitors guide to the secret military base in Nevada, home of UFOs, government conspiracies or anything else you care to imagine. (Okay, I don't take you inside the base itself, but I tried to catalog and collate all the information we did have at the time.) This guide was instrumental in bringing legitimate press attention to the base and making Area 51 a public phenomenon. Here is the 120 page Area 51 pdf file. I am authorizing any member of the human race (and alien races with PDF capabilities) to copy, download and print this document for their own personal use. However, I still retain my copyright to this work. I do not authorize reproduction, modification or excerpts for any commercial purpose. You can not sell this document or steal passages from it and claim them as your own. I'm pretty sure Edition 4.01 was the final one. I assume no liability if any of the info in this book is out of date. Needless to say, I will not be updating it. If you get in trouble because of any outdated info in this publication, that's your problem! If you want to tell people about this document, please give them the address of this blog entry (not the document address) so they have a chance to read these notes (which could be expanded later). As of Feb. 2013, this version is now searchable, replacing the non-searchable version originally released, although they should look the same when printed. This just means that you should be able to search for keywords in the document. If downloading and printing this document yourself seems like too much work, you can buy the same thing from an Amazon seller for $50-500 (Amazon's entry &screenshot). Your choice!